The Appeal Of Canadian Health Care For American Doctors : Shots - Health News Advocates for single-payer health care in the U.S. often look to Canada as a model. But some American doctors practicing there wonder whether the U.S. is ready to call health care a right. 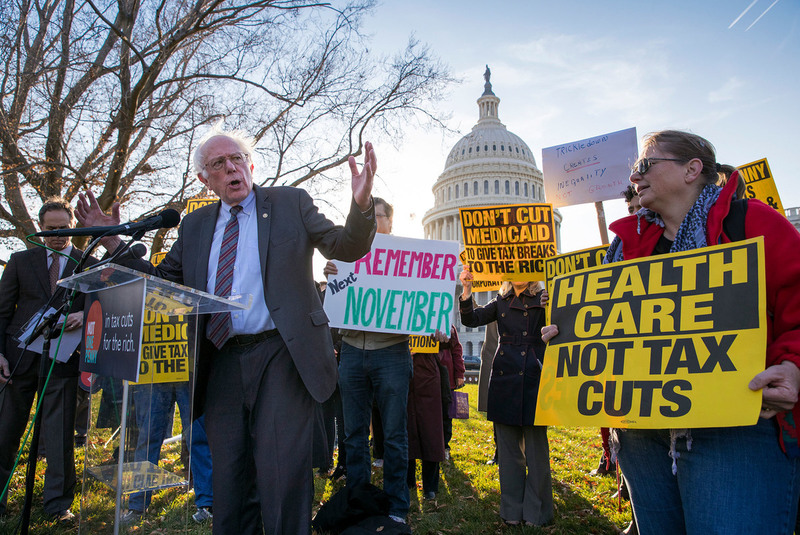 Sen. Bernie Sanders, the Vermont independent, joined protesters outside the U.S. Capitol in late November, as Republicans in the Senate worked to pass a sweeping tax bill. He says he is among a handful of American doctors who went north to practice in Canada's single-payer system. Now he doesn't worry about whether his patients can afford treatment. "Everyone gets a basic level of care," he says, which lets him focus on their medical needs instead of their finances. For all the political talk, it's in many ways still an unresolved question. "The Canadian system is not perfect," Cram said over coffee in Toronto's Kensington Market. "Anyone who gives you a sound bite and says this system should be adopted by [the U.S.] ... I think they're being almost disingenuous." Still, American support for government-run single-payer health care, once a fringe opinion, is picking up momentum. Sen. Bernie Sanders, the Vermont independent who emphasized single-payer health care in his 2016 presidential bid, helped move Canada's system into the U.S. spotlight. In Canada, medical insurance is publicly funded. While covering everyone, Canada still spends far less on health care than the United States: about 11 percent of its GDP, compared with the United States' 18 percent in 2016. To American advocates, Canada's health system sounds like an answer to the United States' challenges. 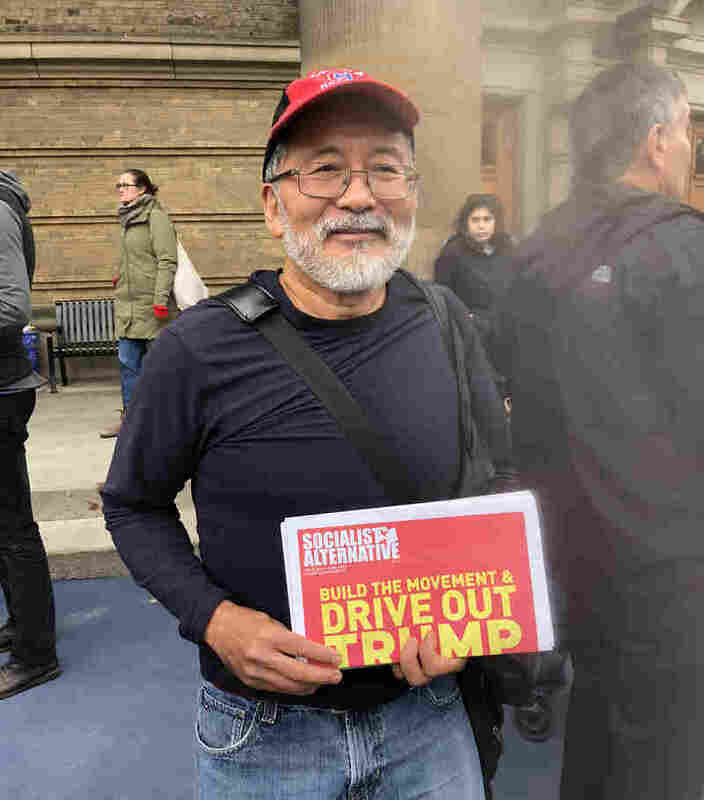 James Sugiyama, a Toronto-based doctor, watched Sen. Sanders' speech on livestream from a restaurant down the street. The Vermont senator is viewed as a "folk hero" by many Canadians, he said. "The U.S. needs to get on with the rest of the world and get an answer on that issue before it answers others," said Dr. Robert Reid, a health quality researcher at the University of Toronto, who has practiced medicine in Seattle. It's an obvious disconnect, said Dr. Emily Queenan, a family doctor now practicing in rural Ontario. Queenan, 41, grew up in the United States and did her residency in Rochester, N.Y. In 2014, after five years of frustrating battles with insurance companies over her patients' coverage, she found herself asking, why not Canada? She moved north. Gone, she said, are the reams of insurance paperwork she faced in America. Her patients don't worry about affording treatment. "We have here a shared value that we all deserve access to health care," said Queenan. "That's something I never saw in the States." Canadian doctors may earn less than do their American counterparts: A 2011 paper published in the journal Health Affairs found that primary care doctors and surgeons alike make more in the United States than in most other western countries. That's in part because, overall, American doctors charged more for each service they provide, and in part because they performed more of them. Critics argue that's a sign of American inefficiency in paying for health care. Meanwhile, the doctors interviewed for this story — internists and family doctors – said they didn't experience any real change in their standard of living when moving north. Sanders has pushed the single-payer discussion with a "Medicare-for-All" bill in Congress and in a visit to Toronto this fall. It was part fact-finding mission and part publicity tour. On that trip, doctors, hospital leaders and patients painted a rosy picture of Canada as a place where everyone gets top-notch care, with no worries about its cost to them. "They have managed to provide health care to every man, woman and child without any out-of-pocket cost," Sanders told reporters on the ground floor of Toronto General Hospital. While progressives tout Canada for efficiently providing universal health care, the Commonwealth Fund puts it just two spots above the United States — which ranks last among 11 developed countries— in the group's health system assessment. Canada still has room to improve in timeliness, health outcomes and equitable access to care. "If you deny there are trade-offs, I think you're living in wonderland," Cram said. In Canada, everyone gets the same, government-provided coverage. Provinces use federal guidelines to decide what's covered, and there's no cost sharing by patients. "Come to our waiting room," said Dr. Tara Kiran, a family doctor at St. Michael's Hospital, in Toronto. "You will see people who are doctors or lawyers alongside people who are homeless or new immigrants. People with mental health issues or addiction issues together with people who don't." But that insurance — which accounts for 70 percent of health spending in Canada —addresses only hospitals and doctors. Prescription medications, dentists, eye doctors and even some specialists aren't covered. Most Canadians get additional private insurance to cover those. "We make improvements or change things only to have additional debates about other things. Those debates are constant, and they should be," said the University of Toronto's Reid. "[But] most of what you hear in the U.S. is back to the tenor of the insurance framework, whether [they] should have Obamacare or not." Taxes in Canada are generally higher than in the United States. But many here call that a concession worth making. "We can't have what we have if we don't pay the taxes," said Brigida Fortuna, a 50-year-old Toronto resident and professional dog groomer, while on her way to a medical appointment. That said, it's not a perfect system. Canadian health care doesn't cover prescriptions, physical therapy and psychotherapy. And there's the concern that Canadians wait longer for health care than would Americans with robust health coverage. "We do have a two-tiered system," he said. "Most know it. Few will admit it." Typically, experts said, people with serious medical needs will jump to the front of the line for medical care. Kathleen Wynne, Ontario's Liberal premier, said the Canadian government is actively trying to improve wait times. But so far, it's unclear how effective that's been. A 2017 report from the nonprofit Canadian Institute for Health Information found that wait times had dropped for hip fracture repairs. But waits for, say, MRIs and cataract surgery have gotten worse. Depending on the province, the average wait for cataract removal ranged from 37 days to 148 days. "You are not going to die because you're waiting," he said on a recent sunny morning while walking with his dog near Kensington Market. "Better wait times for everything? Sure, why not. But as long as the major issues are being covered, then I don't think it's really much of an issue." As Fortuna put it: "If you go for a headache and someone else is going to lose their arm, of course they're going to take care of that person. I'm OK with that, because someday that could be me, too." Waits aren't the only concern, though. There's financing – and what it would cost for the United States to implement a system like Canada's. In Canada, "everyone gets Kmart care," Cram said. "There's no Neiman Marcus care." And there's perhaps the bigger question: Experts don't really know whether the Canadian system is an obvious improvement. The research is limited, and not always recent. A 2006 paper suggests wealthy Canadians and Americans fare similarly, while poor Americans do worse. A 2007 paper found Americans more often liked their quality of health care. More recent research focuses on specific conditions – cystic fibrosis patients did better in Canada, while surgical outcomes were better in the United States. The Commonwealth Fund's most recent ranking places Canadian health outcomes above America's, but only two positions higher. Even so, many Canadians said they couldn't imagine living with an American system. It's a question not just of efficiency, but of fairness. Kreisworth compared his experience to that of family members in the United States. "I talk to my brother's girlfriend who is a part-time worker who has no [health] benefits — who would just be sick and not go to the doctor because she couldn't afford to pay," he said. "I can't imagine that here. It seems like — it's so wrong. It just seems utterly wrong." The initial version of this story understated the proportion of U.S. spending on health care. Instead of 16 percent of GDP, more recent estimates put the U.S. share at about 18 percent.